And my portion, my portion, and my portion for evermore. He’s the lifter, the lifter, He’s the lifter up of my head. In thinking about the passage from Psalm 73, I also recall the opening verses of Psalm 27, my all-time favorite psalm which I committed to memory as a youngster. 9Therefore my heart is glad, and my glory rejoices: my flesh also shall rest in hope. 10For you not leave my soul in hell; neither wilt you suffer thine Holy One to see corruption. My soul wants and even becomes weak from wanting to be in the house of the Lord. My heart and my flesh sing for joy to the living God. The expression “Wait Training” is a homonym for “Weight Training”: a system of conditioning involving lifting weights, especially for strength and endurance.” Those who excel as “Wait Trainers” will have their strength renewed and their lives will be changed. While we wait on God and work for Him, He will work for those who wait for him. The Lord is my light and my salvation. Whom shall I fear? The Lord is the strength of my life. Of whom shall I be afraid? Wait on the Lord. Be of good courage, and He shall strengthen your heart; wait I say on the Lord! 19 Without becoming weak in faith he considered his own body, now as good as dead [for producing children] since he was about a hundred years old, and [he considered] the deadness of Sarah’s womb. 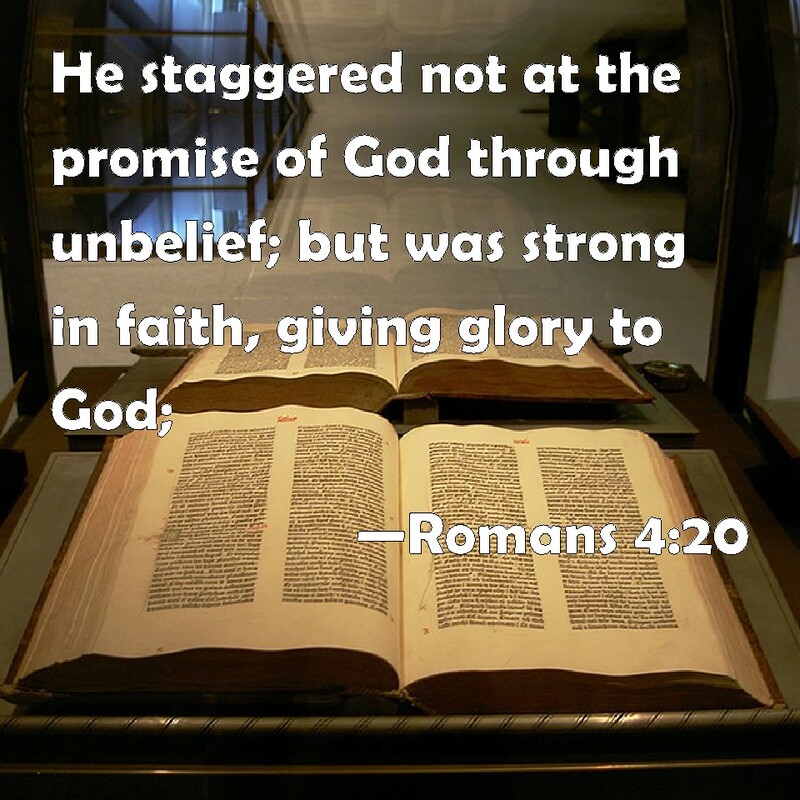 20 But he did not doubt or waver in unbelief concerning the promise of God, but he grew strong and empowered by faith, giving glory to God, 21 being fully convinced that God had the power to do what He had promised. When confronted with what seemed to be an impossible situation, Abraham did not stagger at the promise of God that he would father an heir of many nations, even though he was “about a hundred years old” and his wife, Sarah, was “well past child-bearing” age. Despite the negative circumstances, Abraham was positive and resolute in believing that God would fulfill His promise. In the same way, we must continue to be steadfast in our faith and never quit trusting in God. Always abounding in the work of the Lord. Your labor’s not in vain in the Lord. When mountains block your way. Stand fast, watch and pray. God will give you a song. Trust God and be strong. We close as Alison Southall sings of “Abraham’s Faith,” so described in Romans 4:17-19. Waiting on God is not time wasted; it is time invested. 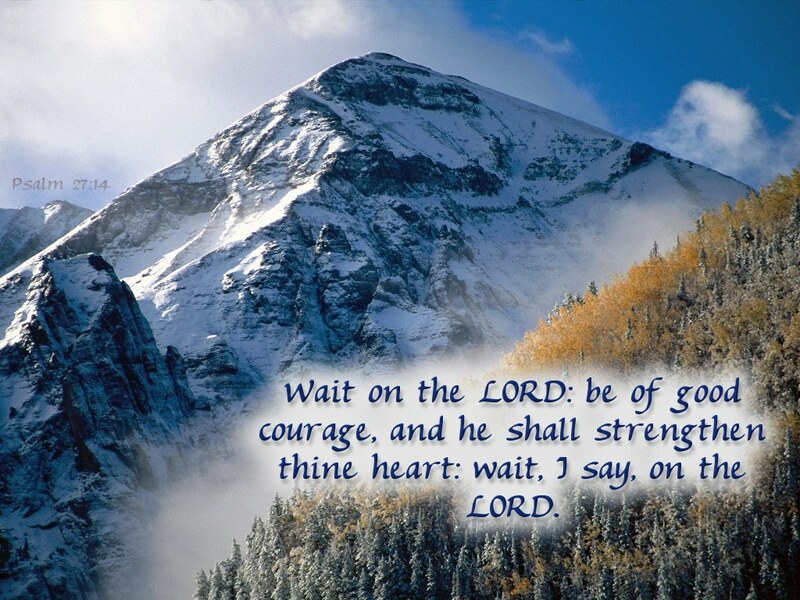 Wait on the LORD: be of good courage, and he shall strengthen your heart; wait, I say, on the LORD! The Quote of the Day brings to mind an incident that occurred years ago whereby I made a similar offhanded remark when I brought in my car for what I thought would be a minor repair that would not take much time. In anticipation that I would not be waiting long, I did not bring any additional work or reading material. When I was informed that I would have to wait almost two additional hours, in exasperation, I remarked to myself, “I’m wasting my time!” As soon as I expressed that thought, I heard the voice of the Lord saying, “Since when is spending time with me a waste of time?” Immediately I repented of that thoughtless comment and apologized. Since that time I have come to realize that spending time with God fellowshipping with the Father is never wasted time. Indeed, it is time well spent. But my prayers do not reach you, and I cry aloud in vain. It seems that for days you have not spoken a word. But the air is still, and there still is no sound. You have pledged your love, and your covenant is true. Both song lyrics and Psalm 27:14 reinforce the message that spending time with the Lord is never wasted time. In learning how to serve and work for God, your strength will be renewed and your life changed while helping others to have an encounter with God.